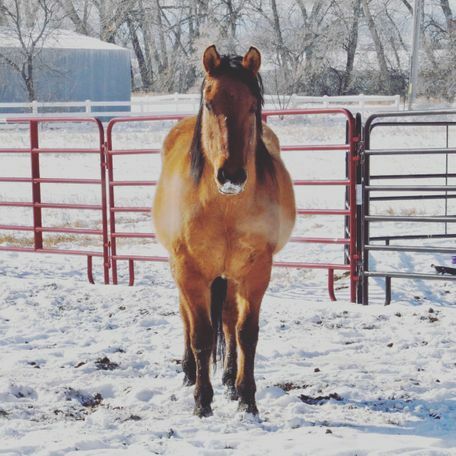 Brandy is a nine-year-old grade Dun mare. Sweet on the ground, just needs a refresher in the saddle. Easy keeping and athletic. This easy keeping, yet athletic little girl is stout and strong yet feminine with her baby doll head and cute little ears. 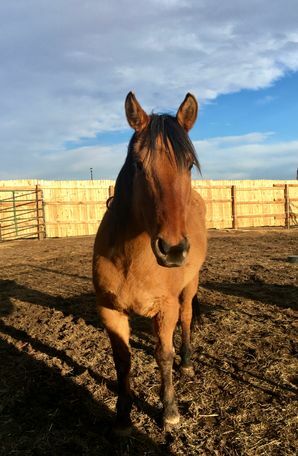 Brandy sustained a soft tissue injury to her left chest (muscle) and has a scar now, but our vet feels it has not affected her soundness in any way. She moves out well. She was broke to ride and we’re told ran barrels, however she had considerable time off and will need to be re-started. Brandy stands tied, is wonderful for the farrier and vet, loves to get groomed and is lovely in the round pen. She’s in the middle of the pack in her herd, and is up to date on deworming and vaccines. Only an experienced home will be approved for Brandy.